Two years ago, we were told about a great program called the “Cultivating Change Grant”. We were fortunate to have been granted $10,000 to improve and innovate our organic growing practices. You can hear a snippet of the interview I did with Jaymie of the Cultivating Change during the Colorful Plates podcast. Colorful Plates website is created and designed by Monterey, Calif.-based distributor Pro*Act to encourage chefs to feature produce in their dishes. The site, Colorful Plates, includes information on seasonality, usage ideas, recipes, storage tips, flavor profiles of various produce items, chef features and more. Be sure to go to http://wshe.es/vtK2A7sT to read about our current proposal to vote for us, PPC Farms! Certify Your Farm as a Butterfly Habitat? Usually insects are considered the “enemy” of the farmers. But did you know that only a small percentage of the insects are actual pests? Sometimes it is just one particular pest that is damaging your crop. If we were to deploy chemical warfare because of the pest, inadvertently we may affect the 95 percent which are benign or beneficial. The Lower Rio Grande Valley is a very special place. With an average mean temperature of about 72 degrees and nearly 325 days of sun, the Lower RGV where our farm is located enjoys the longest growing season in the United States. Temperate and tropic climates meet here, as do the major Mississippi and Central bird flyways. Our unique area serves as habitat to over 300 species of butterflies and 500 bird species. This is THE birding central and butterfly hot spot of USA. According to NABA, North American Butterfly Association, over 95% of this natural habitat has been eroded and the rest endangered due to agricultural, industrial, and urban development. Planting a butterfly garden in the Lower Rio Grande Valley is one way to help restore some of the habitat that has been lost to development and provide resources for wild butterflies to thrive and grow. Another way is for a grower like us to make changes in our practices so that we can restore the lost habitat. Over the past years since we took over the 1500 acre conventional farm in south Texas, we have slowly but surely, implemented proper restorations. Transition over 400 acres to certified USDA organic land. Dramatically reduced the amount of chemical inputs in the entire farm. Increased plant diversity by moving away from monoculture. Incorporated insectary strips to increase biodiversity and provide habitat for insects. Restoring soil health by using cover crops. Each field is now planted with 5 to 10 different crops, inter spaced with insectary strips to have push/pull effects. When we made the above changes at the farm, we started to see more productivity and vigor in the plants. A plant pathologist visited our farm and told me that because different plants have varying root structures, increasing the diversity, and placing them to others, actually will improve the crop as well as the soil structure. Anwar Garza, the PPC Farms Head Field Operations Manager, is explaining our system to visiting scholars and local farmers at the 2nd Hispanic Farmers and Ranchers Conference in McAllen, Texas. Whatever is the science behind it, we are happy to see that our commitment to restoration and regeneration is making changes and capturing attention of others who are also concerned for our environment and its future. Now we think twice before squashing a caterpillar. Finally, I will share with you a very beautiful wild plant that serves as a host for the migrating Monarch Butterflies. These climbing milkweed plants are native to our area. In order to encourage their growth, we leave native trees and bush hedges around the field. You will be rewarded with beautiful butterflies visiting your home! As an organic grower, one of the perks is having abundant produce to cook and eat during our harvest season. Currently, we are still waiting to harvest our winter crop and I don’t have any free produce. In the mean time, what am I cooking with? In our area of south Texas, papaya grow like weeds, their seeds spread by the numerous birds who peck at the ripened fruit. The papaya seeds are easy to propagate, and I have 10 plants in my backyard that we grew from seed. Papaya, while they are still green, have a very high amount of resistant starch which is a bonanza for beneficial gut bacteria. I decided to enhance the benefit even more by making kimchi out of them. First you peel and seed the green fruit. Cut into to strips, then into cubes. Add salt. Here, I am using himalayan pink salt, but you can use any kind. Add Korean red pepper flakes. If you don’t have any, I have used puree of any red peppers, even a bell pepper would work. You won’t have the heat, but the color and flavor from the bell pepper is nice. My favorite is red vine ripened jalapeno puree. Garlic puree is next. If you don’t have any fresh garlic, I have gotten away with garlic powder or granulated garlic before. Thinly sliced scallions are next. If you don’t have scallions, you can substitute with puree of onions. Puree peppers, garlic and onions together to save time. If you are vegan, you can skip this step and just add more salt. The tiny pink things you see are salted shrimps you can purchase from a Korean grocery store. Mix well, using a spoon, or with a gloved hand. Taste to see if you need to add more salt. I usually add some sugar at this stage to help along the fermentation process. 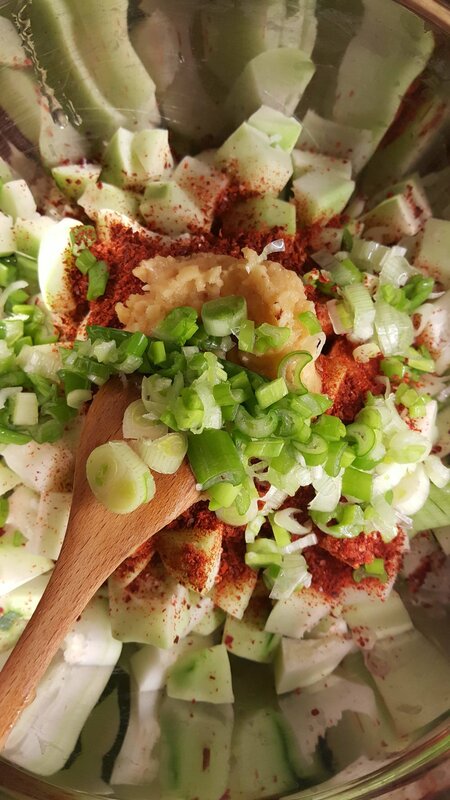 If you are against sugar, you can puree an apple along with garlic, onion and pepper and add the mixture. I have made all variations and combinations, and they have all turned out well. Jar it, and keep it at room temperature for the next two days. Refrigerate afterwards. I left my jar out for 4 days to maximize fermentation. My family commented they prefer a slightly fresher version. My gut, on the other hand, is thanking me for the extra time I had the papaya kimchi out on the counter. 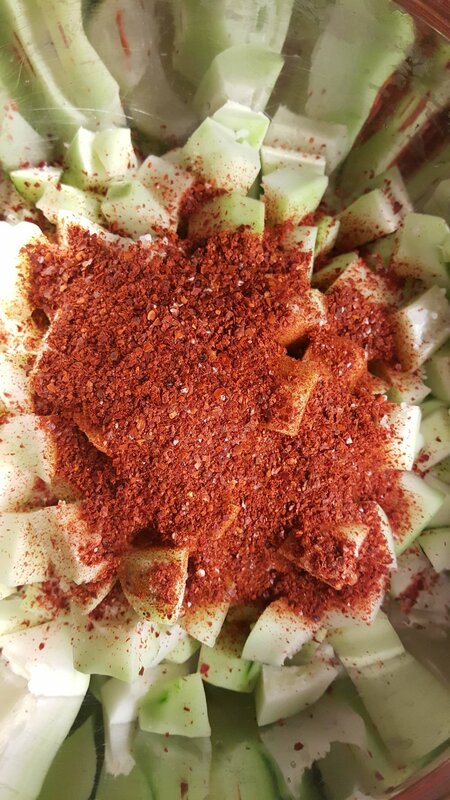 I hope you try making it yourself if you have access to green papayas. DO NOT attempt to make it with ripe fruit! Flowering insectary strips are an excellent strategy for supporting pollinators and other beneficial insects on farms. Planted along field edges or directly within fields, these strips help ensure that flowering habitat is in close proximity to the crop fields where pollination and pest control services are most needed. Insectary strips can be temporary (annual) or permanent (perennial) and native or non-native, depending on the goals and situation at hand. Temporary insectary strips are typically composed of non-native flowers and herbs that provide bloom very quickly and do not require much weed control prior to planting (since the planting will be cultivated at the end of the growing season). Plants such as cosmos, dill, cilantro, basil, mustards, buckwheat, and dwarf sunflowers are examples of what may be suitable for an annual insectary strip. The mix we used at our farm include dill, cilantro, buckwheat, alyssum and sun hemp. They were chosen because of their performance in previous trials, as well as recommendation by Xerces Society. Dwarf sunflowers volunteered themselves. Demand for kale could be robust this season given recent weather events. “This season the demand will be strong for kale. It’s going to be a good year for those who have it because of all the hurricanes in Florida and the Carolinas,” says Lois Kim of PPC Farms in Mission, Texas. The season for kale from Texas will run November through to April. All of this comes after a healthy end to PPC’s kale season in early April. “We had very good-looking kale last season and it looks like we’ll once again have some beautiful products,” says Kim. She notes that PPC has seen yields go up with this new system in place. “And I think ultimately it will help our costs go down and have good yields. Last year we had really good looking product from the fields with multiple crops,” she says. Looking ahead though, she’s waiting cautiously to see how kale pricing will go this season. “Price was a little bit of a concern last season,” she says. Anwar Garza presented the importance of FSMA compliance for small producers at the annual conference at Texas State University in San Marcos, Texas. PPC’s very own Anwar Garza was invited to lead a session for the growers who wanted to learn more about food safety and G.A.P. certification process. Anwar walked the group through the basic process, and shared his experiences and why he believes the practice will help the producers regardless of the size. His expert knowledge made a deep impression on the audience as well as the other presenters at the conference. PPC Farms have complied with Food Safety Modernization Act (FSMA) since its initial announcement in 2009, years before the compliance became mandatory. order to overcome the challenges associated with FSMA. PPC Farms is glad that we could serve our producer community as a leader in food safety area. Among the other presenters were Ray Archuletta, a renowned soil health specialist who tours the country “evangelizing” producers about the benefits of no-till and regenerative agriculture. His demonstration on how no-till soil retains so much water while regular soil causes run-offs and depletion of top soil was quite impressive. Most of the applications were more suited to row crop growers or ranchers, but PPC is looking into incorporating regenerative practices such as cover cropping. Daniel Kim, a fifteen year old farmer-in-training” received a scholarship two years in a row to attend the conference. Even though he was familiar with the vegetable growing, what fascinated him the most at the conference was combining animals with crop production. He also took away many ideas to improve his weekend farmers’ market business. We congratulate Dr. Ken Mix of Texas State University for putting together an awesome conference! Justin Duncan of National Center for Appropriate Technology introduced Pigeon Peas to the Rio Grande Valley as outreach portion of the Conservation Innovation Grant supported cover crop study on September 6th, 2018 at PPC Farms. Justin, a long time plant nerd and agronomist, cares for plants as you and I would rear our own children. He was super excited to trial various summer time hot weather cover crop choices for our south Texas heat. After waiting for a rain in May, he planted several species. Using the survival of the fittest model, Justin chose not to irrigate the field. The pigeon peas emerged as the sole survivor and winner of the contest. On September 6, 2018, Texas farmers who wanted to learn more about this super food crop gathered at PPC Farms research site in Mission, Texas, to witness a quarter acre of verdant, tall and dense population in the middle of a dry field. Dr. Alexis Racelis brought his sustainable agriculture class to the event. He led the students through the field, helping the students make the connection between the textbook and real life plants growing in local ecosystem. PPC Farms will continue to host the Conservation Innovation Grant supported cover crop soil research, working together with NCAT and UTRGV. It was awesome to see so many people interested in and supporting sustainable and regenerative agriculture in our area. When we can, Brighter Bites supports local farmers by sharing the product of their hard work with our participants. After all, it is the growers who spend their days tending to the fresh fruits and vegetables that helps Brighter Bites create communities of health! This year, parents and children in some of our Texas cities have had the opportunity to touch, taste, and cook delicious fresh produce grown in their own state. In Austin, through our partnership with Hardie’s Fresh Foods, we are featuring Texas grown produce throughout our Spring programming. These items include: oranges and grapefruit (Edinburg Citrus Association), bok choy and beets (Rio Fresh), acorn squash (PPC Farms), collard greens (Johnson’s Backyard Garden), red cabbage (J&B Farms), and sweet potatoes (H.M. Smith & Sons). Our friends at Farmhouse Delivery have donated carrots, collards, radishes, kale, turnips, kohlrabi, and bibb lettuce all grown in Texas. We are so grateful to the growers of fresh produce in the state of Texas! Texas based cable company which produces internationally syndicated show, "Discover Texas" featured PPC Farms in their recent episode. Meet the members of PPC and learn their stories here. Suzanne El-Haj and Martha Garcia, co-presidents of the UTRGV Environmental Awareness Club, spearhead the monthly UTRGV Farmers Market, open to students and the public alike and held outside the chapel on the Edinburg Campus. Students and faculty enjoyed looking at and purchasing locally grown spinach, kale, cabbage and squashes, donated to the club by PPC Farms and other organic growers in the valley. Lois Kim, representing PPC Farms, interacted with students who where curious where the farms were located in the Rio Grande Valley. The shoppers received deep satisfaction in knowing who grew and where their food was coming from. Also available for purchase were eggs from local free range chicken raised on non-soy feed and vegan baked treats. Buckwheat, also known as common buckwheat, Japanese buckwheat and silverhull buckwheat, is a plant cultivated for its grain-like seeds and as a cover crop. Buckwheat is not a grain. Many who are trying to avoid grains find themselves limited to fruit and sweet potatoes as sources of good carbs. Even though it’s often included in lists of grains, buckwheat is not a grain. The edible portion is a seed from a plant related to greens like rhubarb and sorrel. Because it is neither a grain nor related to wheat, buckwheat is gluten-free and safe for those with celiac disease and gluten sensitivities. Studies show that even in high concentrations, buckwheat flour and its purified proteins have no immunologic reactions for patients with celiac disease. At PPC Farms, we are co-planting buckwheat and clover with broccoli in experimental plots to study weed suppression, nitrogen fixation and soil temperature balancing benefits. The study was funded by NRCS, awarded to NCAT, and execulted by UTRGV. Natural Resources Conservation Service (NRCS), formerly known as the Soil Conservation Service (SCS) is an agency of the United States Department of Agriculture (USDA) that provides technical assistance to farmers and other private landowners and managers. The National Center for Appropriate Technology (NCAT) is an American organization headquartered in that is dedicated to appropriate technology and sustainability. Projects specifically deal with sustainable energy, sustainable agriculture and food, sustainable living, farm energy, and climate change. The University of Texas Rio Grande Valley (UTRGV) is a public research university in the University of Texas System. UTRGV is one of the largest universities in the U.S. to have a majority Hispanic student population; 90% of its students are Hispanic, virtually all of them Mexican-Americans. LEARN on the FARM- RGV South Region KICK OFF! On November 27, 2017 at 6pm to 8pm, special kick off event for RGV South Region of the Texas Academy took place at PPC Farms. The members of Texas Academy of Nutrition and Dietetics learned about organic farming, local produce, about the “story” behind PPC farms contribution to community health, and enjoyed some healthy recipe sampling. It was organized by Andie Lee Gonzalez. Mission-based PPC Farms recently placed second nationally in the PRO*ACT Cultivating Change contest, winning $10,000. The funds will enable PPC Farms to reach its goal to protect their crops from various pests and diseases without the use of pesticides and fungicides. The farm plans to purchase floating row covers for use in the farm’s organic brassica and cucurbit production. Grants range from $1,000 to $20,000 and are of use to complete a wide variety of sustainability and expansion projects. These projects positively impact each winning farm as well as the surrounding community. Established in 1972, PPC Farms grows a wide variety of fruits and vegetables, including kale, lettuce, onions, squash, tomatoes and avocados. They partner with Hardie’s Fresh Foods, a PRO*ACT fresh produce distributor and member of Greener Fields Together, a program that supports sustainability throughout the fresh produce supply chain. 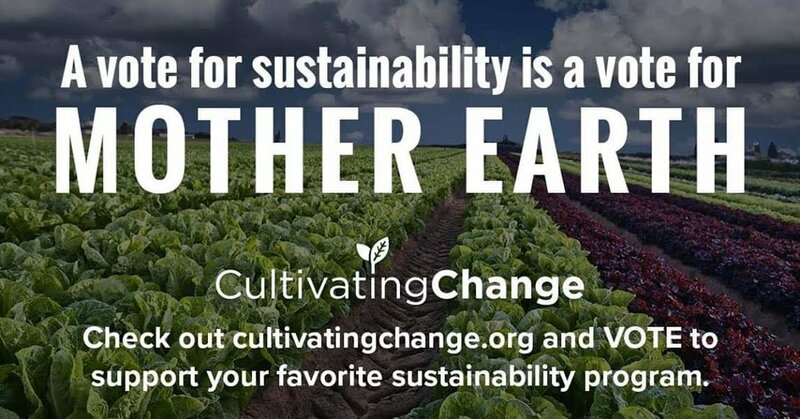 Cultivating Change began in 2015 as a way to promote and support the sustainability efforts of local farmers. It provides funds for new or upgraded equipment and facilities as well as certifications. It also funds eco-driven projects that will both minimize environmental impact and maximize production. This year, 100 farms participated in the grant program. Since it’s inception, Cultivating Change has awarded more than $200,000 in grants. This year, six project proposals were recipients of a total of $55,000 in grant money. Additionally, five outstanding winners, who each will receive from $1,000 to $10,000 in grant funds, were chosen via popular vote.